I'm open to offers as I would like this gone before it needs to be stored. I have someone that can trailer this boat anywhere you need. I can give you a quote if you give me a location. If you're from out of town and want this stored until next season, I can arrange to have it stored, winterized and wrapped until you're ready to pick it up. I'm even willing to deliver it myself if gas is covered. Insured value is at $13'000 in its current condition (this was the purchase price). I had a full survey done last year and the boat is in proper condition to insure. Only cost me $600 to insure for a year. I have all the original manuals + more printed off. I have repair logs & receipts as well. 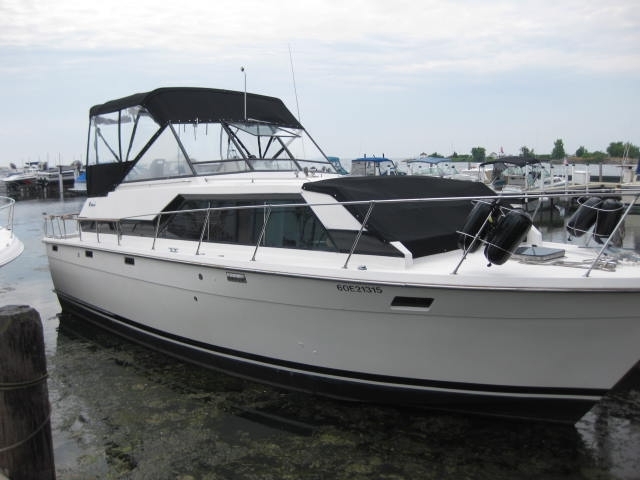 F36 Trojan, Length 36', Beam 13', Dual Stations, Twin Chrysler 440s, genset generator, 1 VHF radio, 1 depth finder, electric Fridge, stove with oven, heat, head, Air conditioning etc. Canvas Bimini, windshield and hatch covers, flybridge cover. Starts and runs great, classic fiberglass boat with beautiful teak trim. The mechanics and electric system work beautifully, it's just minor cosmetic/woodwork that needs to be finished. If you know how to do this, you're all set. Otherwise I'll be restoring it over the winter and re-listing it at the proper value. I can go over absolutely everything that needs to be fixed if you come see the boat. It can honestly be completed in under a month, even a weekend of intense work. - Pulled off the front hatch, re-sealed it with butyl tape, re-fastened it. The interior is a bit rough because I'm in the middle of restoring it. I've replaced and sealed all the deck screws because they were leaking. There's 2 spare propellers that go with the boat. It runs, floats, it was great while I was single for the summer, but it's of no use to me anymore. I'm in the middle of renovating my house and I need a truck. I would like to trade the boat for a truck + cash if possible. I'll sell for $12000 if it is gone before it needs to be dry-docked.